If you have an Internet connection, the planner will help you to create your route (or modify an existing one) very easily. Click on the map to choose your steps, or search a location. Simply change the position, the name and the order of your steps, and visualize your itinerary. 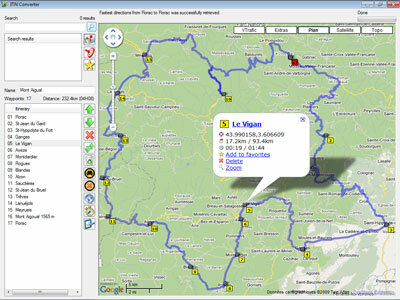 ITN Converter is based on Google Maps, ensuring you always up to date maps. It is also possible to select the background map among those offered by Google Maps, Tomtom Roads, ViaMichelin, Microsoft Bing Maps, and many mores. You want to organize a group excursion (motorcycle or car rally, for example), but all participants have not the same kind of GPS. No problem! Create your route with the planner, then upload your route to all GPS. You're assured that all follow the same route without the risk of errors. You are salesman and you want to maximize your tour? Put your steps on the map, and with one click the planner will calculate the optimum route. ITN Converter represents a complete solution for planning all your trips, both fun and professional. There is also a travel version that can be put on a USB key. This version is identical to that desktop one, except that preferences are saved in a file instead of the registry. 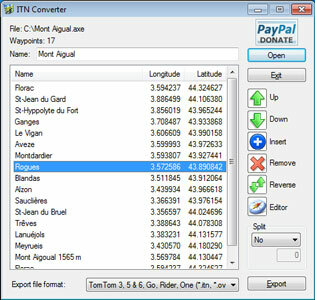 ITN Converter is free, try it now !! If you would like to become a supporter of the project, please make a donation with Paypal.